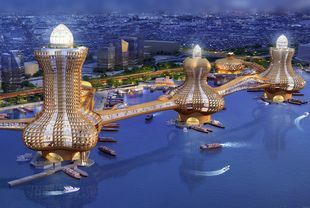 Work on the detailed design of Aladdin City, a project inspired by the fables of Aladdin and Sindbad, on Dubai Creek is currently under way, a senior Dubai Municipality official has said. “We have appointed Meinhardt Group as consultant and they are working on the design of the three buildings,” Daoud Al Hajri told Arabian Business when he held the position of director of the planning department at the municipality. In September, he was promoted to become assistant director general for engineering and planning. The consultant has been given a one-year timeframe to complete the detail study. “The concept design is there with the whole detailed design being completed in a year’s time,” Al Hajri said. Aladdin City, announced in 2014, consists of three commercial and hotel towers. It will have air-conditioned bridges (in the form of dragons and snakes) with moving floors to connect the towers, driveways and parking lots. The three towers will have a built up area of 110,000 square metres with the highest tower being 34 storeys, while the other two will be 26 and 25 floors, respectively. The project will have total parking space for 900 vehicles.